SPREAD THE WORD PEOPLE! IF THIS EVENT IS SUCCESSFUL WE CAN MAKE THIS A REGULAR THING! PARTY 105 HAS AND ALWAYS WILL SUPPORT FREESTYLE MUSIC! Stevie B will bring in a lot of people. Last edited by ronnie d; October 8th, 2008 at 07:10 PM. Great lineup.You don't need 15 acts to put on a great show. Its not the quantity,it's the quality. Stevie, Lisa,Brenda,Judy & Nayobe...all huge names! This is definaltely a solid lineup. 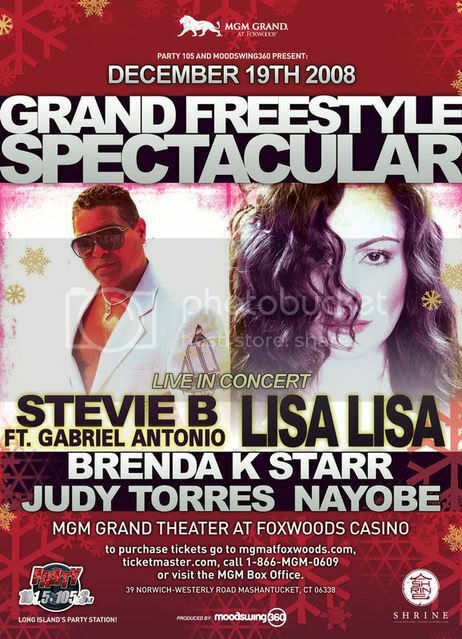 Stevie will be there with his band and his new artist Gabriel Antonio. I hope to see everybody there. Party 105 has been playing "I wanna be the one" 2008 on light regular rotation.